"We are fortunate enough to live on a planet that is ideal for the development of complex life," says New York University Biology Professor Michael Rampino. "But the history of the Earth is punctuated by large scale extinction events, some of which we struggle to explain. It may be that dark matter – the nature of which is still unclear but which makes up around a quarter of the universe – holds the answer. As well as being important on the largest scales, dark matter may have a direct influence on life on Earth." Rampino's model of dark matter interactions with the Earth as it cycles through the Galaxy could have a broad impact on our understanding of the geological and biological development of Earth, as well as other planets within the Galaxy. He concludes that Earth's infrequent but predictable path around and through our Galaxy's disc may have a direct and significant effect on geological and biological phenomena occurring on Earth. In a new paper in Monthly Notices of the Royal Astronomical Society, he concludes that movement through dark matter may perturb the orbits of comets and lead to additional heating in the Earth's core, both of which could be connected with mass extinction events. 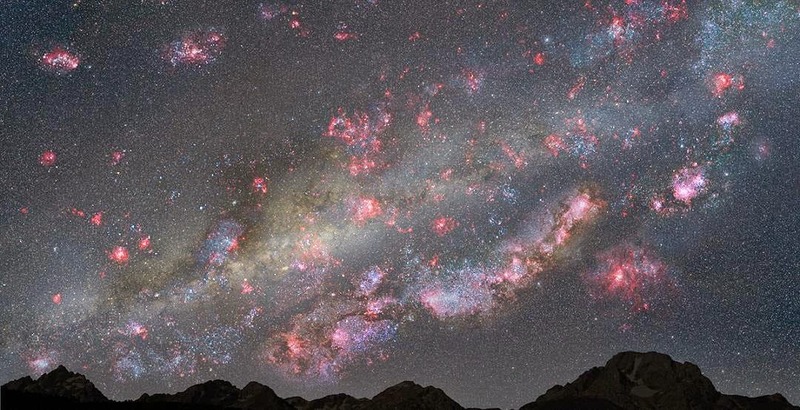 The Galactic disc is the region of the Milky Way Galaxy where our solar system resides. It is crowded with stars and clouds of gas and dust, and also a concentration of elusive dark matter–small subatomic particles that can be detected only by their gravitational effects. Previous studies have shown that Earth rotates around the disc-shaped Galaxy once every 250 million years. But the Earth's path around the Galaxy is wavy, with the Sun and planets weaving through the crowded disc approximately every 30 million years. Analyzing the pattern of the Earth's passes through the Galactic disc, Rampino notes that these disc passages seem to correlate with times of comet impacts and mass extinctions of life. The famous comet strike 66 million ago that led to the extinction of the dinosaurs is just one example. What causes this correlation between Earth's passes through the Galactic disc, and the impacts and extinctions that seem to follow? But even more remarkably, with each dip through the disc, the dark matter can apparently accumulate within the Earth's core. Eventually, the dark matter particles annihilate each other, producing considerable heat. The heat created by the annihilation of dark matter in Earth's core could trigger events such as volcanic eruptions, mountain building, magnetic field reversals, and changes in sea level, which also show peaks every 30 million years. Rampino therefore suggests that astrophysical phenomena derived from the Earth's winding path through the Galactic disc, and the consequent accumulation of dark matter in the planet's interior, can result in dramatic changes in Earth's geological and biological activity. The Hubble image above is an artist's view of night sky from a hypothetical planet within a young Milky Way-like galaxy 10 billion years ago, the sky are ablaze with star birth.